After hitting "Submit" below, an email to the appropriate party will automatically be generated with the information from this form. Please send the email. Thank you for choosing ECM TRANSPORT. Please fill out Trade References section completely and clearly. Include company name, contact name and phone numbers. 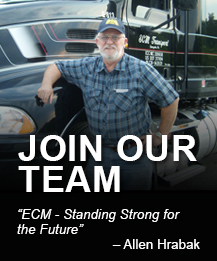 ECM TRANSPORT wants to provide our customers with the best invoicing process in the industry. All credit approved customers will receive a detailed invoice with an applicable bill of lading (BOL) enclosed. Please list any special or additional information that needs included with the invoice. Note: Invoices are mailed on the day they are processed. All invoices are payable to ECM TRANSPORT, LLC. within thirty (30) days from the date of the invoice. Any invoices not paid within ECM TRANSPORT’s terms will be considered delinquent. If an account remains unpaid after the passage of thirty (30) days, interest on the unpaid principal balance will be charged at a rate of 1.5% monthly, equal to 18% annum. All past due accounts will be suspended until the account is brought current unless prior arrangements are made with ECM TRANSPORT’s accounting office. Legal actions will be taken by ECM TRANSPORT, LLC. in order to enforce the collection of all past due accounts. The applicant will pay all reasonable legal fees, including but not limited to, attorney’s fees and court costs. All payments shall be made to ECM TRANSPORT, LLC. at its corporate office in Allegheny County. Any suit may be instituted against the applicant in the Court of Common Pleas of New Kensington, PA and the applicant consents to such venue and jurisdiction. The laws of Pennsylvania shall apply to all sales and extension of credit to said applicant. All claims must be presented to ECM TRANSPORT, LLC. within a period of nine (9) months from the time of shipment. All claims must be presented in writing and must comply with all regulations listed in Chapter III of the Federal Motor Carrier Safety Administration, Department of Transportation Part 370, sections 370.1, 370.3, 370.5, 370.7, 370.9, 370.11. If such notice is not provided to ECM TRANSPORT, LLC. within the legal time, applicant shall be barred from asserting any fault against ECM TRANSPORT, LLC. Signed bills of lading are provided with every invoice and a copy will be faxed to the applicant, without charge, for one request. If the applicant requests additional copies after the first has already been provided, a research charge will be assessed to the applicant per request. This will also apply to faxing invoices and bill of lading when the invoice becomes past due. All associated mailing charges will also be assessed to the applicant at a reasonable charge. Detention will be charged to the applicant at a charge of sixty dollars ($60.00) per hour after the standard two (2) hours free, unless other arrangements are made prior to the load being picked-up. Any lumper or unloading charges paid by ECM TRANSPORT, LLC. associated with the loading and/or unloading of trailers will be charged back to the applicant. ECM TRANSPORT drivers always negotiate the best possible lumper prices. If a load requires lumper services at pick up or at unloading, it must be stated at the time the load is booked on your rate confirmation. Stop offs and/or additional pickups will be charged to the applicant at a cost of seventy five dollars ($75.00) per occurrence. In addition, any out of route miles will be charged at a reasonable per mile rate. All trucks ordered not used (TONU) will be charged at a minimum of two hundred fifty dollars ($250.00) depending on the routing of ECM TRANSPORT’s trucks and time involved on said TONU. I understand and agree to ECM TRANSPORT, LLC.’s terms and conditions, which are listed above, and agrees to adhere to these terms and conditions.I hereby authorize ECM TRANSPORT, LLC. to make whatever inquiries it deems necessary in processing the foregoing credit application. ECM TRANSPORT, LLC. also reserves the right to refuse credit if the inquiries we make are deemed unsuitable. All credit information is confidential. Hitting "Submit" will generate an email to the appropriate party at ECM TRANSPORT.